I don’t know about you, but my inbox can get a little out of control with messages from retailers, community groups, product companies and a slew of other e-news and e-marketing that comes my way. How do I get so many? I’m genuinely interested in many of the groups or companies, but sometimes the volume can overwhelm. I have some coping strategies, but I digress. What I want to talk about today is one of those tired and trite marketing slogans that’s overused too much at this time of year: New Year, New You! I think last year that message reached critical mass in my inbox, causing me to throw up my hands in vexation; I just didn’t want to read that message one more time. It just seems lazy and, honestly, doesn’t speak to me. Personal goals don’t have to be tied to the calendar year; they certainly don’t for me. Ok, I’ll end this rant. Because today I want to talk about New Year’s Resolutions! No seriously. Are you confused? At the turn of a new year, I do tend to get on the bandwagon with one type of resolution — the bookish type! The 50 book reading challenge has inspired me for the past five years. I like tracking my reading, so that I can reflect on what I’ve read, what I haven’t read, and what I should be reading. I find it interesting to track what books I’ve dipped into, and having a goal set encourages me to keep track consistently. I use reader social media site Goodreads to track my reading, but there’s also the 50 Book Pledge you can take advantage of. In 2015 I read 35 books; impressive considering I was proofreading and copyediting part-time half the year, and caring for a young baby the first half of the year! Reviewing my list, I see I opted heavily for fiction, including 9 mysteries and 5 chick lit novels, as well as reading the Canada Reads shortlist. 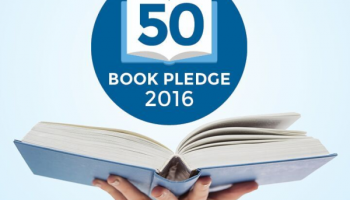 For 2016, I’ve set a goal of 50 books (initially I set at 45, but then I thought, let’s do this!). Who knows what 2016 will bring? I’m commuting this winter 3 days a week, so that gives me more time to read. As well, I’ve been getting into a couple new mystery series that will surely have me burning the candle into the wee hours. Are you setting a reading challenge or goal for 2016? Or do you rather keep your reading leisurely and non-goal-oriented?